It is a usual, known wedding dress for the bride and I am going to wear a usual groom suit. I have attached a photo of a common turkish couple in their wedding dresses (of course these are not us :)). And by the way, could you also draw the veil for the bride? " 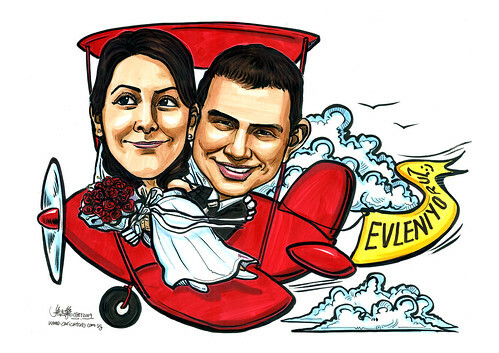 If my memory doesn't fail me, this could be the first time I drew such airplane, and wedding couple in such airplane. Looks good. The bride lsent me quite a number of photos. I chose this photo as reference for the caricature, as she looks pretty good in it. To my surprise, Turkish wedding gown and suit are just similar to those Western type. I thought it is something very different before I opened up the attachment. Thanks for your great work. We both liked them a lot. Above address is also ok.